Firstly I must apologise for the truly awful quality of the image here, but….you try to shoot at ISO 1600 for 1/6th sec at f2 in a relatively dark room with an SLR dangling face down off a wobbly tripod and get a usable image. To be honest if this was any post other than a “what’s in the bag” I would’ve spent a lot longer and taken a far sharper, nicer and generally better image, but it isn’t so there we go. So as the title suggests, and keeping with my new approach to this blog, this is all about what’s used to take the photograph and not the photograph’s themselves. I’ve never really done anything like this before and this is a very rough idea of what I have in my frankly ruined old bag that is NOT designed for photography at all. McLaren Messenger bag- Not designed for photography and pretty old and ruined but it’s the right size for what I take with me. Long overdue for an upgrade to something a bit more specialised or at least not full of holes. Olympus OM-D EM-5 with 17mm 1.8 M.Zuiko lens – Although relatively new for me this has become my go to digital kit for street photography. The camera is small, quiet and inconspicuous and the lens has a nice wide aperture with the 35mm full frame equivalent focal length of 34mm so not too tight but also not too wide. Olympus OM-1 with 50mm F Zuiko Auto-S 1:1.8 lens- Ah there she is, my beautiful blue workhorse, the vast majority of film photography on this blog recently, especially street photography has been taken on this. The blue leather body covering is custom, I sent off to Japan for it and was surprisingly easy to do, it’s light for an all metal film SLR and the lens is lovely, who doesn’t love a classic 50mm piece of glass? Olympus Zuiko Auto-T 135mm 1:3.5 Lens – A lens I don’t often use but I’m loathe to leave behind in case the opportunity arises, to be honest it’s bloody difficult to keep my shaky hands from causing horrible blurring when using anything like this manual at this focal length but as I just said, I’m loathe to leave it behind. Vivitar 28mm 1:2.8 Lens – Other than the 50mm this is the other lens most film shots taken on this blog will have been shot with, it’s not the fastest in terms of aperture but it’s nice to use and was a bargain basement price on ebay so I’m not complaining. Nikon Lens Bag – Yup this is re-purposed from a Nikon Lens that is no longer in need of it. I usually keep the 28mm Vivitar or 50m Auto Zukio in it, depending what’s attached to the OM-1 at the time. Headphones – Couldn’t do without these, nothing makes you look like just another person in the crowd and ignored than a man lost in his music. Pen & Notebook – Where else do you jot down the focal length, aperture and shutter speed when you’re shooting film? I actually didn’t used to carry this until I read an article about film photography that suggested it, felt like a right plank without it. Integral Ultima Pro 16GB SD card – Pretty obvious where this goes. Fomapan Classic 100 Monochrome film – My standard film for shooting black & white, mainly because it’s cheap but also because for the price it’s surprisingly versatile, can be shot a few stops down or over and still give usable images and did I mention it cost’s a fraction or Ilford? 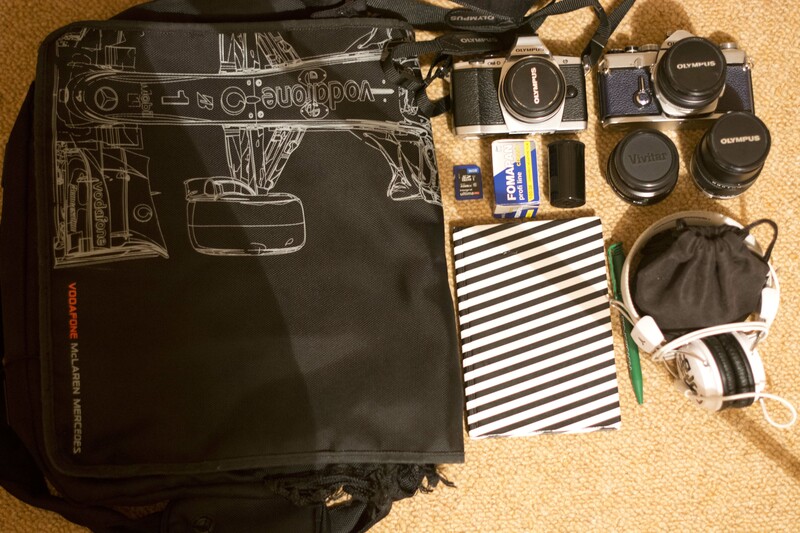 So there we go, that’s what’s in my bag when I’m wandering the streets, how about you? What do you guy’s carry around with you when you’re out photographing? Let me know in the comments, be interesting to see inside other people’s bag’s. That’s a much lighter looking set up than mine, although I would hazard a guess that the FM10 and AE-1 together much weigh quite a bit. maybe for a 6year old, but to me it nothing really. those camera were built to last compare to digital cameras. I guess the great thing is if anyone try to attack you physically, just got to swing my bag and they will get a pretty go hit with the metal those cameras are made of.